There are an increasing number of locations on Anglesey where people are lucky enough to have red squirrels visiting their gardens. These pages provide advice on red squirrel diet and on the types of foods that can be offered to them. Squirrels will often take the peanuts and sunflower seeds from your garden bird table. However, it is best to offer a variety of different foods and providing a few hazel nuts and walnuts will increase the value of the garden as a feeding site for the animals. Red squirrels will eat fruit and carrot and providing slices of apple, pear or plums can make a satisfying treat. It is also important to provide a source of calcium either near the squirrel food or elsewhere in the garden. Cuttlefish or antler nailed to a tree or fence post are ideal sources of calcium. There a couple of food types to try and avoid. Wheat, dried maize and peas are not particularly useful foods, whilst old Brazil nuts can cause poisoning and death. 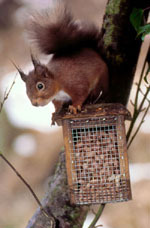 Domestic Cats can kill red squirrels and obviously attracting red squirrels to bird feeders can increase the risk of predation. It is therefore prudent to make sure that food isn’t scattered on the ground, and that squirrels are fed on platforms or bird tables that are placed as high as possible and in a location that does not require the red squirrels to cross lawns or open ground to reach them e.g. on a fence or fixed to a tree trunk. What to do if a grey squirrels visits the garden? 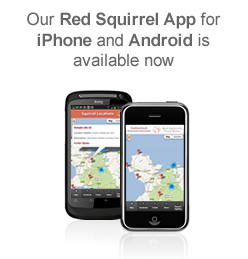 If grey squirrels appear in the garden please contact us (07966150847) or contact us via the website. It is important that the grey squirrels are trapped and removed to prevent deadly disease epidemics; and the project can do this for you. If greys are known to be in the area, you should also cease feeding the red squirrels and try to minimise the amount of foods put out for birds. It is known that grey squirrels carry the ‘squirrel-pox’ virus which, if transmitted to red squirrels, can cause very high mortality rates. 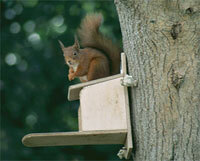 Once the grey squirrels are removed from the area it is safe to restart feeding the red squirrels. 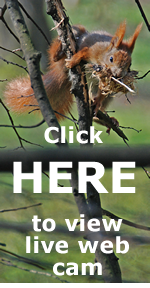 Those with practical skills might like to build a red squirrel feeder using our online red squirrel feeder plans, alternatively if you live in the project area you can contact the project to request a wooden feeder.